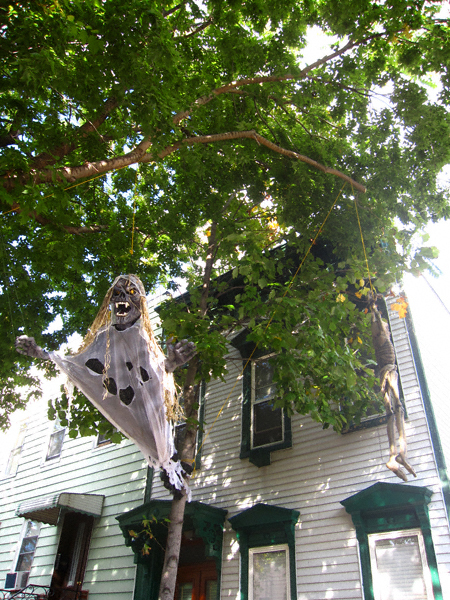 Greenpoint Halloween Watch: It Has Begun! October has found its way to the Garden Spot. Since the weather was absolutely stunning I decided to table the blog and go for a walk. 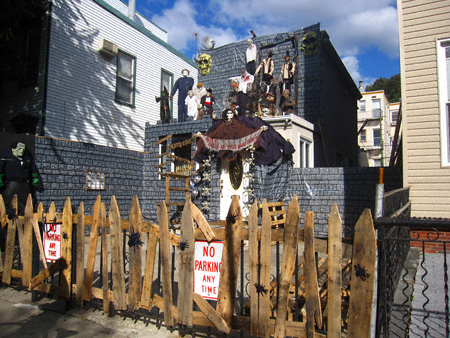 On a lark I decided to swing by my favorite house on Humboldt Street to see if they have commenced work on this year’s Halloween extravaganza. For those of you who are not in the know this is yours truly’s favorite holiday of the year. They have! What’s more, I wasn’t the only person to notice that something very exciting is going on at 648 Humboldt Street. Female passerby: Wow, this wasn’t here yesterday. Me: Yup, and they’re just getting started. Me: These people go all out. Wait until they bring out the guy who vomits up blood. He’s my favorite. F.P. : Do they do this kind of thing for Christmas? F.P. : It is not as good? Me: It’s good alright. They make it look like a ginger bread house and have a full-sized Santa and Mrs. Claus. It’s cute. But I don’t like cute. It like (pointing to ghouls on the second floor) this. To refresh your memory dear, readers, as to the glory of that is 648 Humboldt Street on All Hallow’s Eve I have resurrected a slide show of last year’s masterpiece. Enjoy! I have much more Halloween goodness from the Garden Spot to share— so stay tuned! 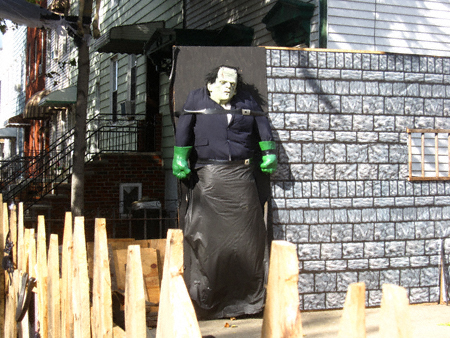 One Comment on Greenpoint Halloween Watch: It Has Begun! 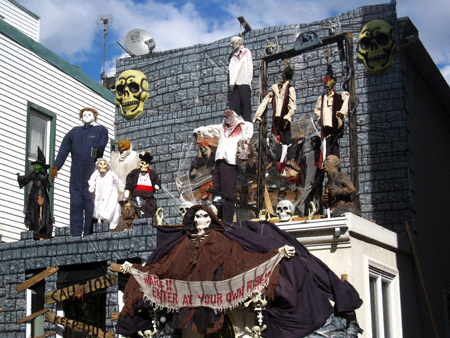 I lived at 650 Humboldt from 2000 to 2005, which were key years in the development of the 648 Humboldt Halloween aesthetic. I feel quite proud to have been privy to such pivotal shifts as the inclusion of annoying, persistent audio elements around ’03, and of course the costumed guy who would jump out and scare the crap out of you when the 31st rolled around. Those early years seem so quaint now compared to the current badassery! Sadly, all photographic documentation was wiped out in a hard drive crash.